So this is what I came up with. You may remember Pearl coming into our family about this time last year as DD2's birthday present. Well it turns out I have taken to having a bird in the house much more than I ever thought that I would. In fact Pearl has really come in and taken over the house! Everyone just adores her and loves spending time with her, and she loves spending time with us. 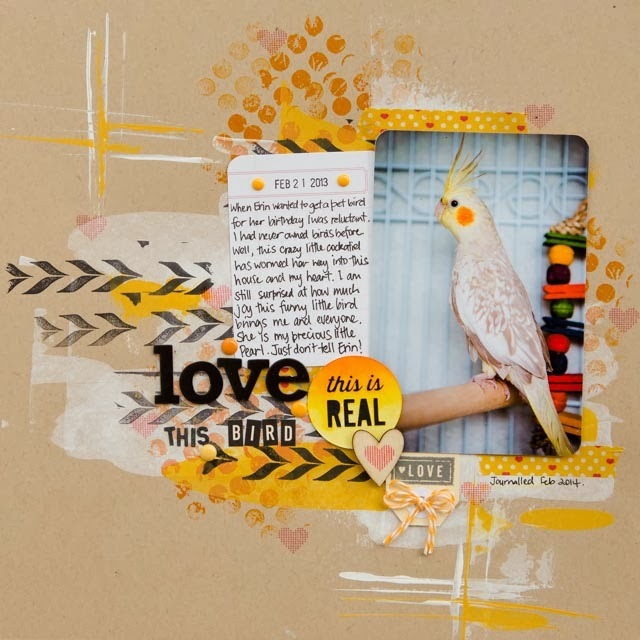 I just had to use yellow and orange as my colours when scrapping about Pearl, which makes it a bright happy page too! Isn't she a sweet little thing??!! Well, that's it for now, thanks for dropping by. This is fabulous! Don't think I've ever seen a page about a pet bird before.The colours are perfect. Totally sweet and happy and sunny. I love your use of the bright yellow with kraft. We have various birds (albeit bigger ones - chooks and ducks) and they really do bring such joy, don't they? Absolutely awesome!!!! love all that yellow and your bird is AMAZING! Nawww this is so pretty Katie i just love love love all the paint work thanks for joining us at Kraft it Up for February's challenge you nailed it!